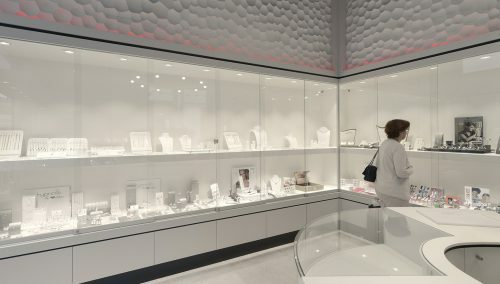 A busy new shop in Charleroi for Bijouterie Laurent. 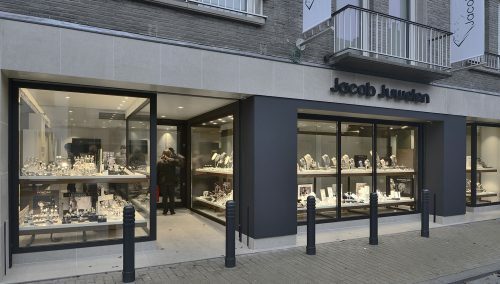 In the brand new Rive Gauche shopping centre in Charleroi, Bijouterie Laurent opened a new flagship store in early March. This is their fourth shop. Every shop has a different concept. The last two shops were designed by WSB Interior Construction’s retail designers and were delivered turn-key within time and budget. Rick Blankenstijn of WSB Interior Construction: “The Bijouterie Laurent shop has a number of great eye-catchers. The bronze wall presentation above the showcases with indirect light is the key feature. It is a fully integrated concept, with bronze details in the showcases combined with a hard floor and high-gloss white accents and matted accent colours in structured finish. This gives the watches, jewellery and materials an attractive extra value. The counter top as an advice island in the center of the shop has a central place, leaving the walls free. This gives the shop a higher sales per m2. I very much appreciate Olivier’s and Vanessa’s entrepreneurship. They have a talent for binding their clients with their team, in a contemporary, professional and charming manner. The Rive Gauche shopping centre had a flying start with high visitor numbers. All successful retail chains are represented here, from Pull&Bear to Bijouterie Laurent. Why does Olivier work with WSB? Olivier Laurent (in French): “WSB creates distinguishable shops. We felt a click after the first meeting. We wanted experience, security in all openness, a warm ambiance and innovation. 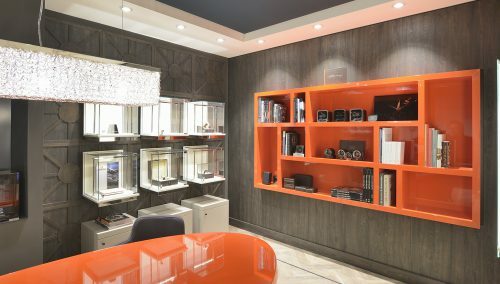 More than just a collection of jewellery showcases. How was the pricing: “The pricing is affordable, viewed as a total investment. You really need a party who does everything under direct management. It’s a must.” Any issues during construction? The WSB retail designers make your offline jewellery shop a commercial success. WSB translates the emotions and feelings into a unique interior. WSB makes the shop brand more powerful by creating an experience. We understand what really motivates people and what influences their buying behaviour. In order to keep our designers up to date with trends and developments within the jewellery sector, they are familiar with world cities such as Copenhagen, New York, Paris, Berlin and others. Bijouterie Laurent: "Every concept is different"